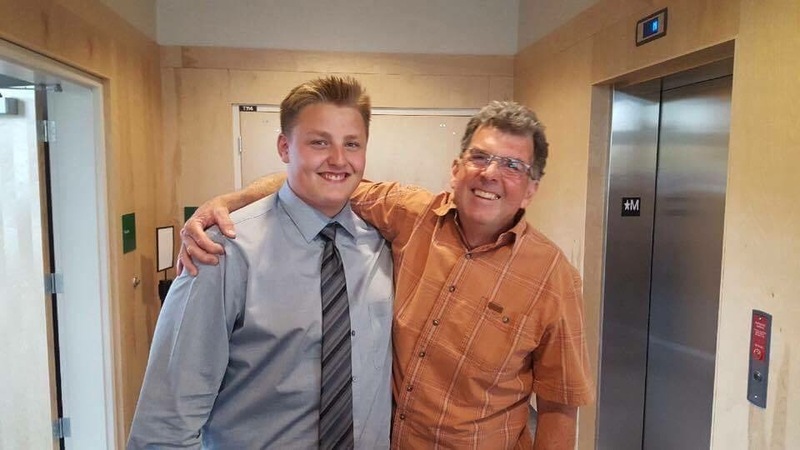 Oliver’s Adain Kirs is this year’s recipient of the Wine Country Racing Association scholarship! Adain is headed into Heavy Duty Mechanics. Good luck Adain, from all your friends at WCRA! Adain Kirs, left, with Gary Dell from WCRA. Photo credit: Dan Hodson. This strange sight at Richter Pass Motorplex in Osoyoos on Father’s Day is how drag racers make an umbrella. WCRA lined all the street cars up at the starting line during the rain delay in an attempt to keep the water off the track. 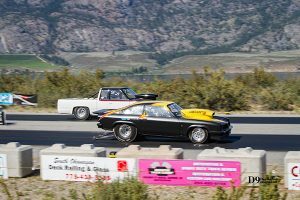 Last Sunday, June 18, Wine Country Racing Association (WCRA) hosted their last drag race for the spring portion of their 2017 season. It may have been Father’s Day, but Mother Nature made sure everyone knows she’s still the boss. Rain delayed the side-by-side drag racing action for a while, but it didn’t stop the racers from having the last word. 52 racers had their rides out to Richter Pass Motorplex and failure wasn’t an option. Here’s how the day ended up for the determined bunch of gear heads. Rookie drag racer Colleen Davis took the win home to Enderby, BC with her 1955 Chevrolet Bel-Air. Osoyoos, BC’s Elvis Glenn (who is no new-comer to the final round of competition) had his 2003 Ford F-150 truck lined up against Davis. James Lutz (1966 Ford Fairlane) beat Oliver’s Cliff Meeds (1949 Ford pick-up) to take a second consecutive trophy home with him to Enderby, BC. Oliver, BC’s Clint Peterman (1979 Chevrolet Camaro) won his bracket by zipping past some stiff competition. Levi Weiberg (1981 Buick) came from Grand Forks, BC to make sure Peterman had to fight for his win this week. The trophy for the bike/sled class headed south across the 49th parallel. Winner Bob Henrie (2009 Polaris 1QR) came from Conconully, WA to compete in a fast field against West Kelowna, BC’s Dan OFukany (1999 Arctic Cat ZRTR). 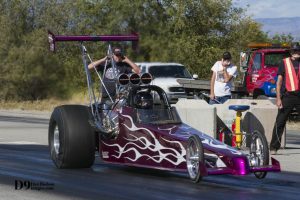 With the heat coming on, the drag racers in Osoyoos will shut down for the summer. The big Car Club Challenge returns to the Osoyoos airport on September 24. In the meantime go to www.winecountryracing.ca or keep in touch on Facebook. Photo by Dan Hodson. Pat McGinnis (Nelson, BC) and Wade Lahaise (Ladysmith, BC) get the green light at Richter Pass Motorplex in Osoyoos, BC. These two were part of the Nostalgia Gasser special event. Last weekend brought with it (finally!) weather that suits the slogan “Osoyoos, BC – Canada’s pocket desert”. Mother Nature let up with her rain storms, and the drag racers didn’t waste one second of the gorgeous weather. Richter Pass Motorplex was packed to its boundaries with racers and fans alike. Wine Country Racing Association (WCRA) played host to nearly 80 drag racers and over 500 fans at the second event of their spring racing segment. Pat McInnis from Nelson, BC organized a special events class, called Nostalgia Gassers, and the good-looking, high-wheeling group was added to the already bursting program.These drag cars styled after the 1960’s era gasser cars, gave the youngsters a glimpse of drag racing’s roots, and took some of the more seasoned fans back to days-gone-by. WCRA had a second special treat last weekend. Rookie announcer 13 year-old Lukas Doggett, from Osoyoos, picked up the mic and wowed the fans. This lad has attended almost every race that WCRA has put on, since he was 3 years old. And, let me be the first to tell you that it shows. Doggett’s knowledge of the sport and of the cars made his time behind the mic really stellar. Osoyoos’ Glen Taylor cruised his 1990 Mustang to victory over Joel Medeiros’ (Surrey, BC) 1967 Chevrolet Nova. The Pro Bracket was owned by the gentlemen from Enderby, BC this weekend. Jason Lutz, with his 1966 Ford Fairlane, took the victory over Rob Roell and his 1969 Plymouth Valient. Oliver, BC’s team known as DDK, with its three alternating drivers David Sabyan, Don Cachola and Ken Brown took the trophy for Super Pro in their 1978 Monte Carlo. Opponent Ron Peterson from Oroville, WA had his 1971 El Camino running great for driver Pete Shaw. Shaw is from Penticton, BC. Dan Ofunkany might have zipped away with the bike/sled trophy with his 1999 Arctic Cat snowmobile, but rumours were flying that he’d spend Sunday night on the couch, beating Brenda Ofunkany and her 2005 Harley Davidson sportster. West Kelowna, BC’s husband/wife drag racing duo both had huge smiles as they left Richter Pass Motorplex. Two reaction time trophies were handed out at the end of the day, Sunday. Penticton’s Pete Shaw (1971 El Camino) cut a nice .504 starting light. Oliver’s Clint Peterman (1979 Chevrolet Camaro) out-did the entire bunch with a PERFECT .500 light. Peterman is one of the hard working volunteers that did double time this past weekend, working for both the Cactus Jalopies car club, as well as WCRA. Great job! WCRA has one more race this spring, racing on Father’s Day, June 18. Grab Dad (and Mom too) and enjoy a day at the track. Gates open at 9 a.m. Racing starts around 11 a.m. Elimination round begins at 1 p.m. Concessions are available on site. 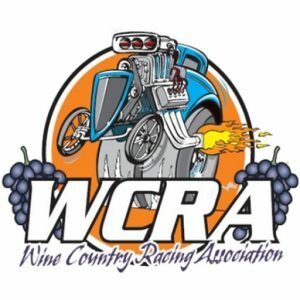 The season-opener for the Wine Country Racing Association (WCRA) was a great start to the 2017 season. Sixty-seven racers registered to have the chance to see exactly what their ride can do. When the array of registered cars range from everyday driver type sedan, to full blown designated race cars the crowd of nearly 400 spectators is bound to be delighted all day long. An added treat for the fans, drivers and the club members alike was the addition of three Junior Dragsters to the day. These young drivers are exactly who WCRA hopes to target with their program. Kyler Skjonsberg brought his 2006 Jr. Spitzer all the way from Red Deer, Alberta to take home a trophy. Mark Sherriff from Summerland drove his Deputy Diesel Ford F-350 Super Duty truck to victory. Kelowna’s Gord Hoeft took his 1973 Ford Mustang to the winners’ circle. Ralph Pool, from West Kelowna, raced home with the Super Pro trophy in his 1968 Plymouth Baracuda. David Layton took the trophy home to OK Falls, with his 1999 Yamaha. Peachland’s Phil Walter made sure he got the reaction time trophy by nailing a perfect .500 light, not once, but twice! Walter drives a 1986 Nissan truck. 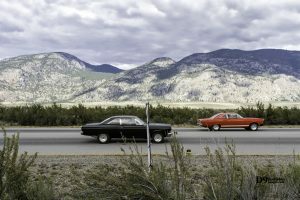 The next drag racing event in Osoyoos will be on Sunday, June 4. Gates open at 9 a.m.
Richter Pass Motorplex. Do you know where it is? Any other day of the week it is known as the Osoyoos airport. 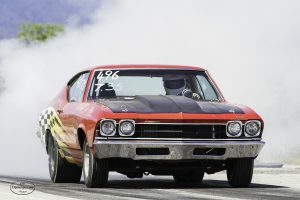 But last weekend the Wine Country Racing Association (WCRA) opened the gates to a flood of drag cars from all over British Columbia and Alberta. They needed to come see what’s shakin’ in the Okanagan. The weekend did not disappoint. A record smashing 113 drivers registered to line their cars up and see just what they could do. Fans flocked to R.P.M. and made the event a complete success. WCRA had their 7th annual Car Club Challenge. This rumble of four different car clubs is always a hit with the fans. This year The Kelowna Kustoms club drug home the trophy. Their driver, Ian Haryett (’65 Comet Caliente) beat Vernon Cam Jammers’ Luke Stabu (’72 Nova) to the finish line. This puts the Kelowna Kustoms ahead of all the rest, with 3 wins. Cliff Meeds, from Oliver’s Coachmasters, raced his ’69 Chevrolet truck to the winners’ circle in the Fast Four Shoot-out. Sportsman Bracket winner Rob Wylie from Vernon, BC (’72 Chevelle wagon) raced Gord Hoeft from Kelowna, BC (’73 Ford Mustang). In the Pro Bracket James Lutz and his ’66 Ford Fairlane (Enderby, BC) zipped past his competition, Ron Carlson’s ’70 Chevrolet Nova (Kelowna, BC) to take home the trophy. Grand Forks, BC’s Rob Skilling (’70 Chevelle) drove to victory over Penticton, BC’s Dean Book (’86 Ford F150) in the Super Pro division. Bike/Sled class saw Creston, BC’s Jim Mehedon (’02 Gen 2 sled) fly past Kelowna, BC’s Dan Ofukany (’99 Arctic Cat ZRTR800) to drag the trophy home. 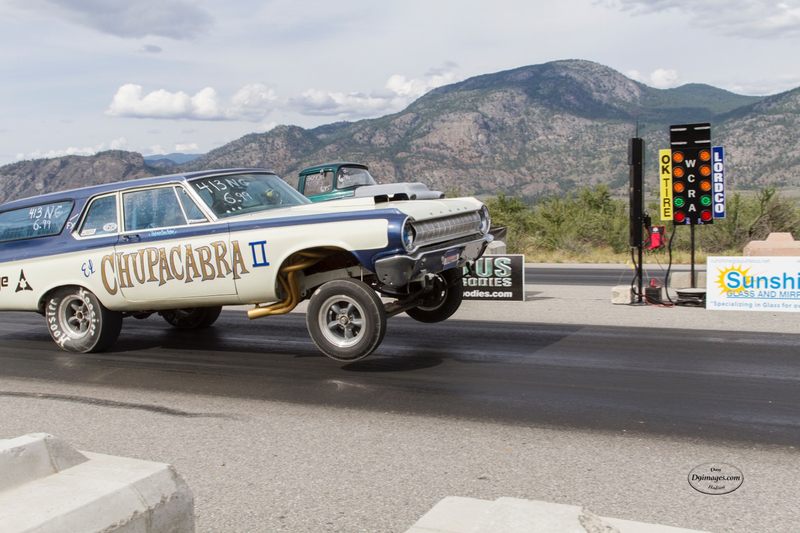 Only one more event for the 2016 season is slated from the South Okanagan’s drag racers. Sunday October 9, 2016 the gates will open up at 9 a.m. RACERS: you are encouraged to come early for registration and to pass your vehicle through technical inspection. Late-comers may not have opportunities for many qualifying passes. Fans are welcome early as well. Concessions are available on site, complete with breakfast menu. Fill the grand stands, drag along your favourite lawn chair or back your rig up to redneck row. Every seat in the place gets the thrill of live side by side 1/8 mile drag racing action. 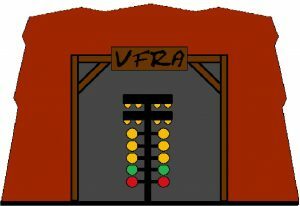 The Vermillion Forks Racing Association (VFRA) will be holding their inaugural event Sat., Aug. 27 and Sun., Aug. 28. at the Princeton Airport. Doors are open at 2:00 p.m. on Saturday, and again at 8:00 a.m. on Sunday. Racing will be hand drop and stop watch 1/8 mile. Admission for spectators is $10 per person, kids 12 and under get in free! For racers, it’s $40 to race and $10 to get in. Vendors will be on-site during races. And don’t forget your lawn chairs and umbrellas for shade! Camping is available for racers and pit crews only; no camping is permitted for the general public. Washrooms and security will be on-site. Volunteers are still needed! As a volunteer you get free admission as well as complimentary food and drink. If you have any questions as a vendor, racer, or volunteer please contact Randy Folk at 250-295-6924 or Mario Martins at 250-293-6394. 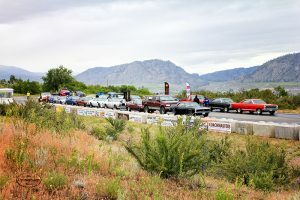 Sunday June 5 was a scorching hot day in Osoyoos, BC, but that didn’t deter racers and fans from enjoying the day at Richter Pass Motorplex. Wine Country Racing Association (WCRA) staged races for 60 vehicles for the crowd’s entertainment. Osoyoos’ own Tim Hiebert (1990 Ford Mustang) drove past Larry Jamieson, of Grand Forks (2008 Ford Mustang) taking home another trophy. Paul Lewis (1984 Chevrolet Corvette) from Tonasket, WA beat Osoyoos, BC’s Heath and George Anthony (1983 Ford Mustang). Brad Quwek comes all the way from Bruderheim, AB with his 1973 Astra to win out over Peachland, BC’s Phil Walter in his 1986 Nissan pick-up. Terry Soluk (2007 Kawasaki Ninja), from OK Falls, BC triumphs over Grand Forks, BC resident Art Raymond (2001 Suzuki Katana). Two trophies were given for perfect .500 reaction times this weekend. Larry Jamieson (2008 Ford Mustang) and Kelowna, BC’s Paul Fode (1970 Plymouth Couda). Father’s Day, June 19, is the next drag race at the Osoyoos airport. This will wind up the spring segment of drag racing in the desert. Gates open at 9 a.m. Racing starts around 10. The final, elimination round begins at 1 p.m. $10 admission, with those 12 and under free, when accompanied by an adult. There are no race results from May 29 due to rain out! Join us at the next race, June 5.